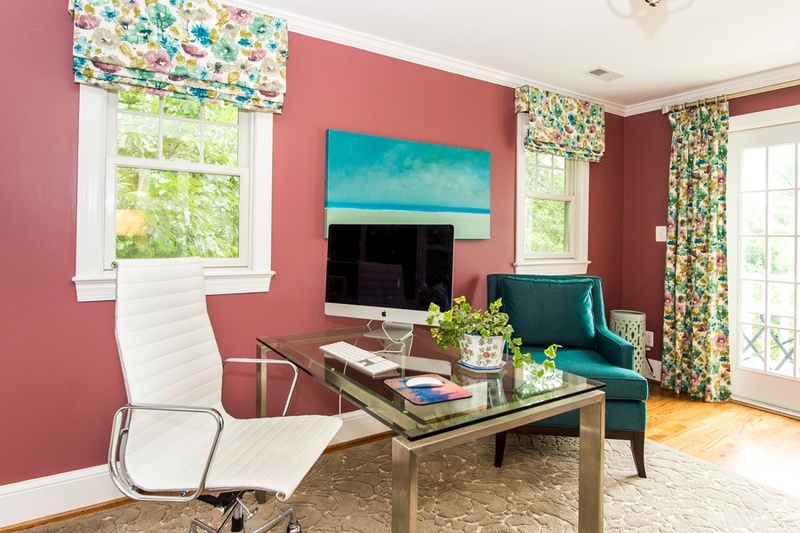 A charming Airbnb, favorite restaurant, cozy coffee house, or a piece of artwork can all serve as design inspiration for your decor. 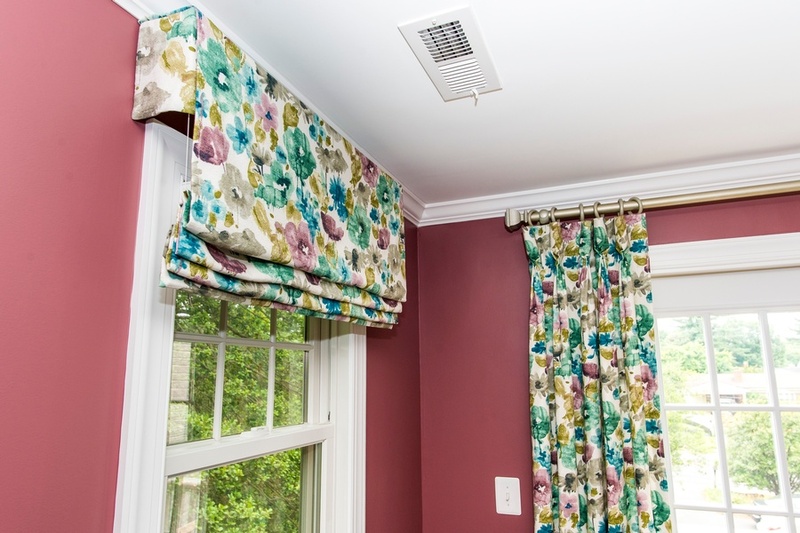 How wonderful would it be to bring the colors, patterns, shapes, fabrics, or textures of those beloved places or things into your own home? 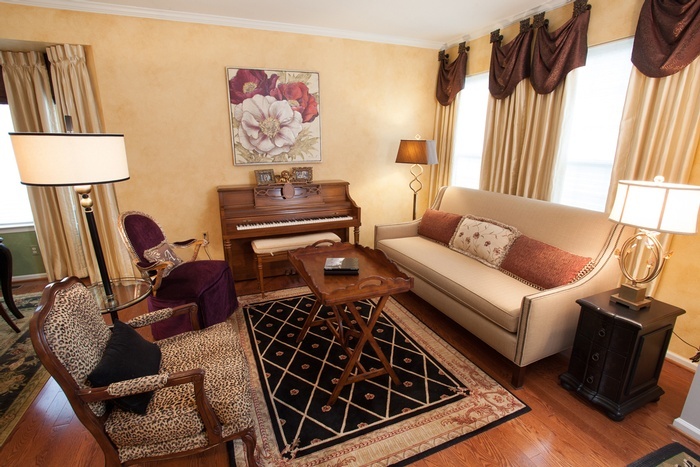 That is exactly what Janet Aurora’s client was hoping to do. Her favorite restaurant, The Ivy Chelsea Garden, is located in London and features tufted leather sofas and benches, hues of salmon and sage, botanical patterns, and artwork surrounded by lush gardens and flowers. 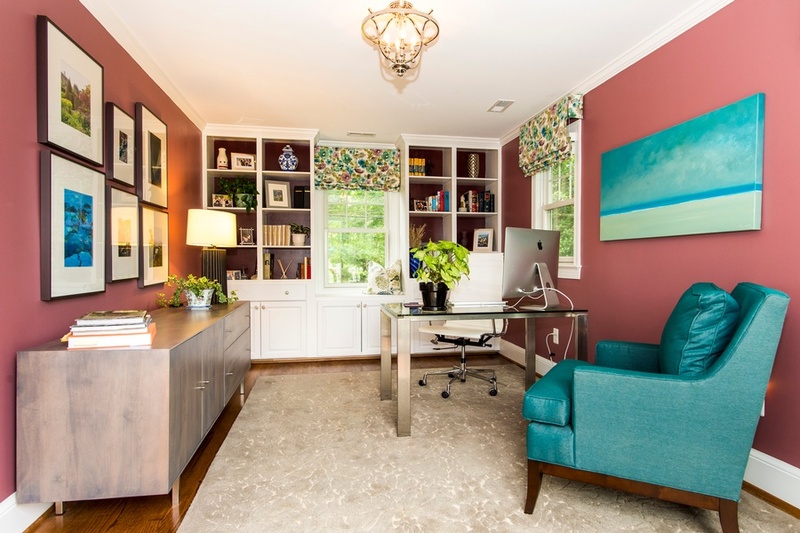 Take a look at how Janet used this point of inspiration in the client’s living room, dining room, entryway and study. 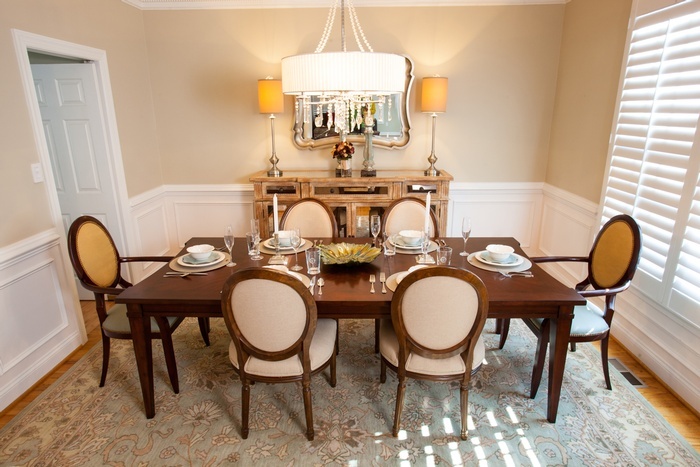 To accommodate space for a dining room table that would seat eight, we eliminated the existing fireplace. 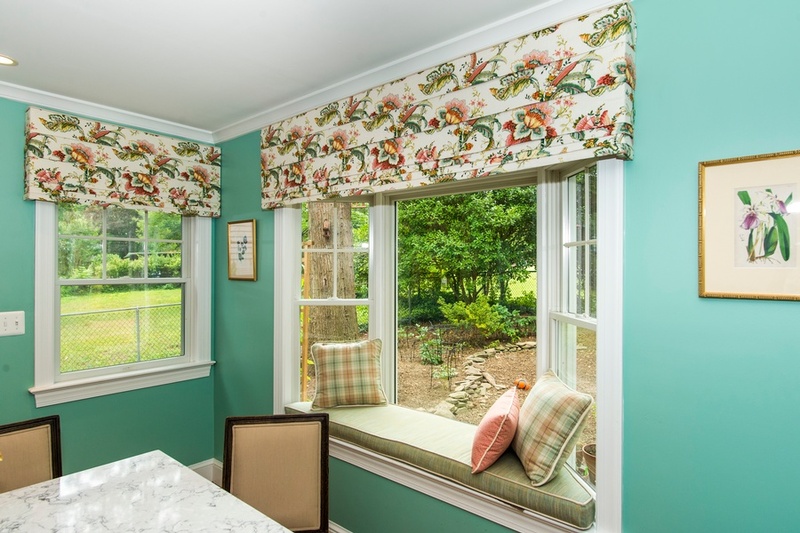 Janet custom designed a table with a beautiful wrought iron base and marble top, selected botanical prints for a gallery wall, and floral valances for the windows, all set against a fresh turquoise backdrop. 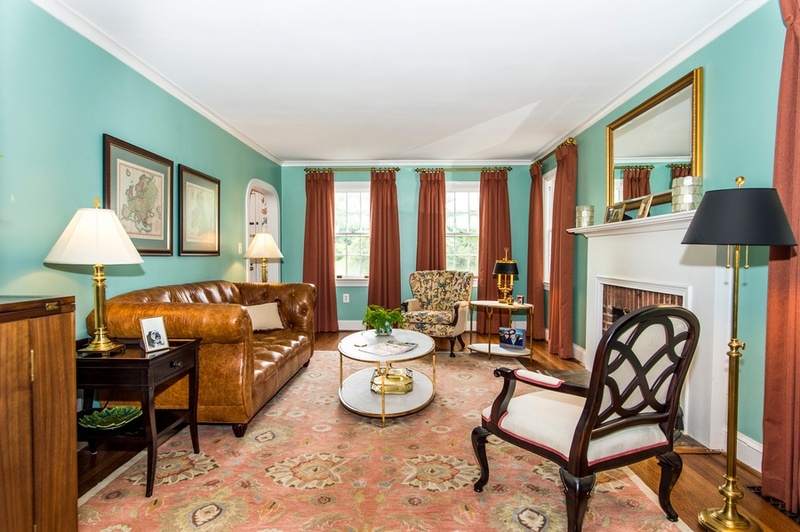 Nods to The Ivy Chelsea Garden can be seen throughout the living room and entryway. 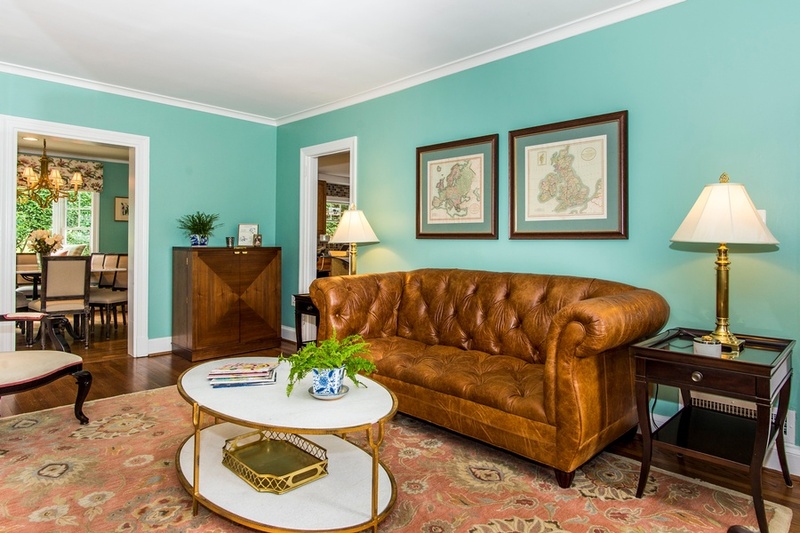 A custom leather tufted sofa anchors the living room and compliments a beloved “Grandma’s chair” with crewel fabric, which was restored to its former beauty. 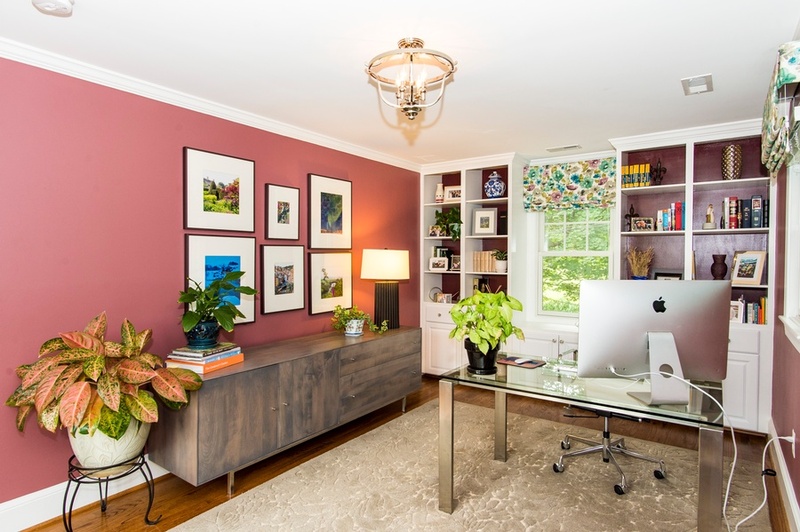 Walls painted with Benjamin Moore’s Dreamcatcher 640 and dark salmon hued draperies create a color palette that is strikingly similar to the al fresco setting in London. 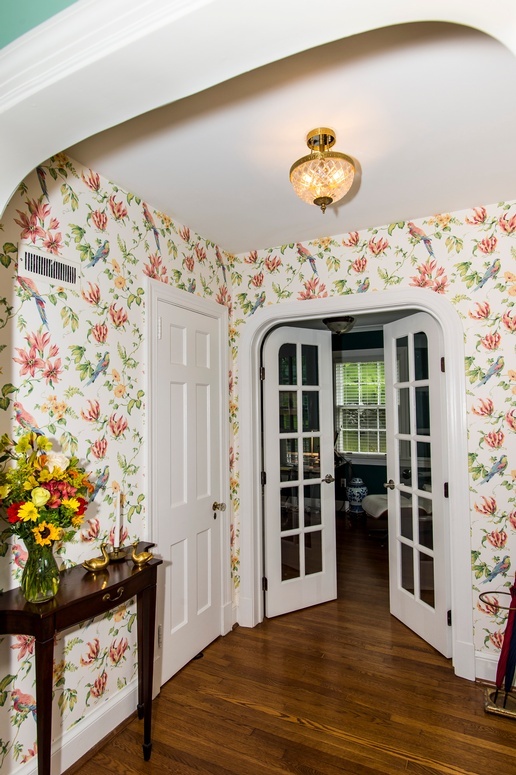 In the entryway, floral patterned wallpaper introduces the garden fresh theme seen throughout the home. 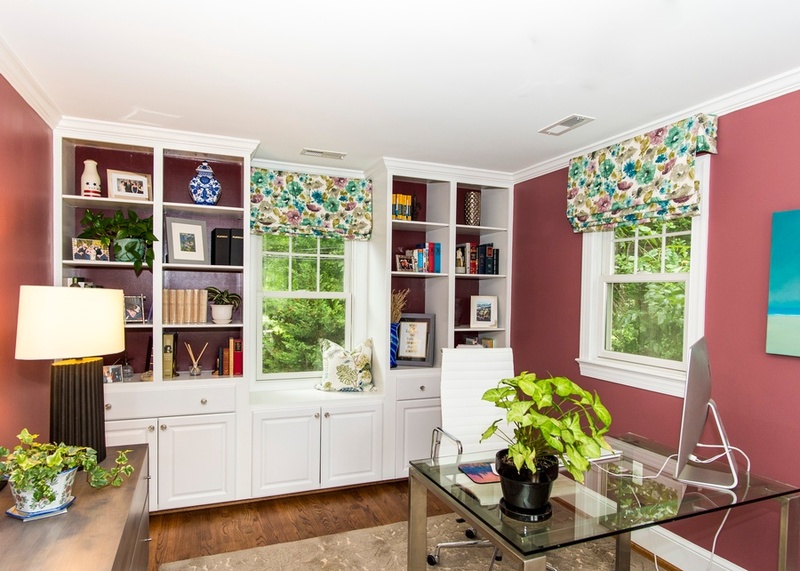 Janet transformed an existing bedroom into a study by claiming the space from two reach-in closets to create custom built-ins with lighting. 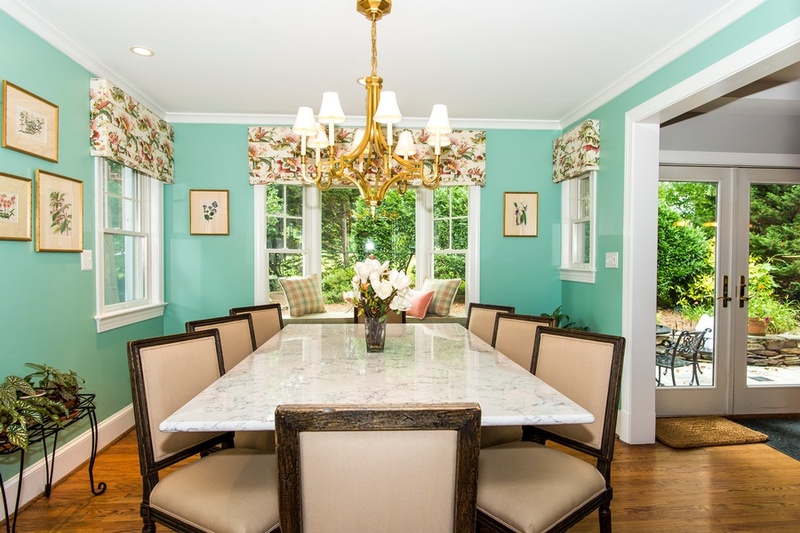 Many of the homeowner’s own furnishings were used in this room, but Janet added a much-needed reading chair in turquoise to bring a nice pop of color, window treatments, and an area rug to tie the space together. 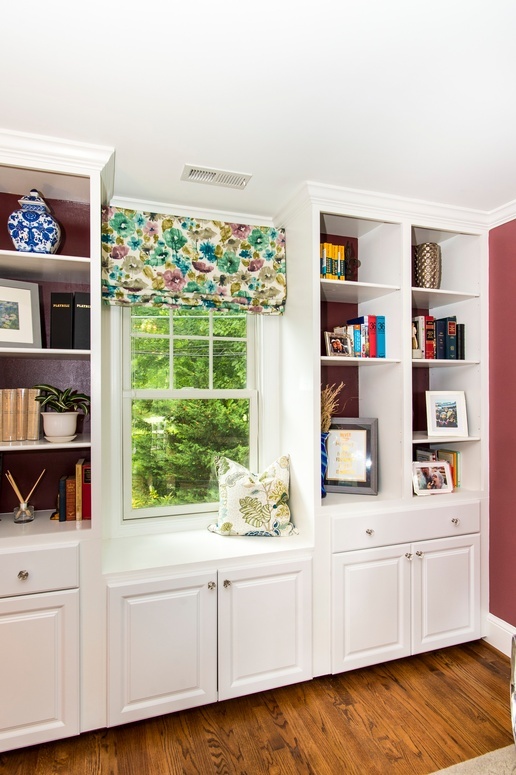 Benjamin Moore’s Deep Mauve was used on the walls and Ruby Dusk was added to the back of the cabinetry to add depth and interest.We also added French doors that lead out to a small balcony for a place to take a break or have lunch. 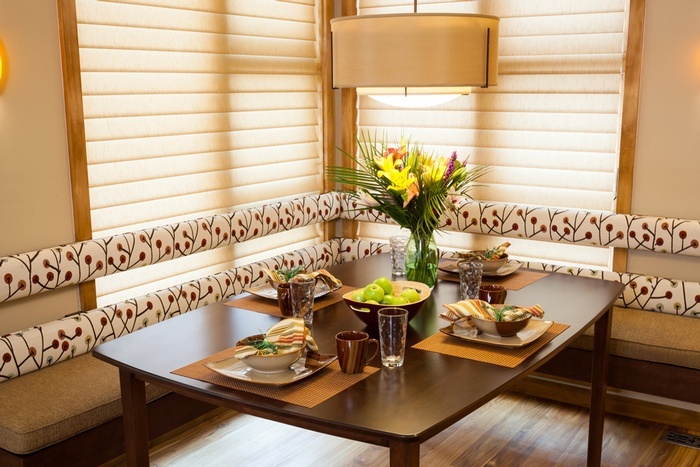 We love the way these spaces turned out and hope our clients will enjoy their spaces inspired by their favorite restaurant. What inspires you and where would you like to see it come to life? 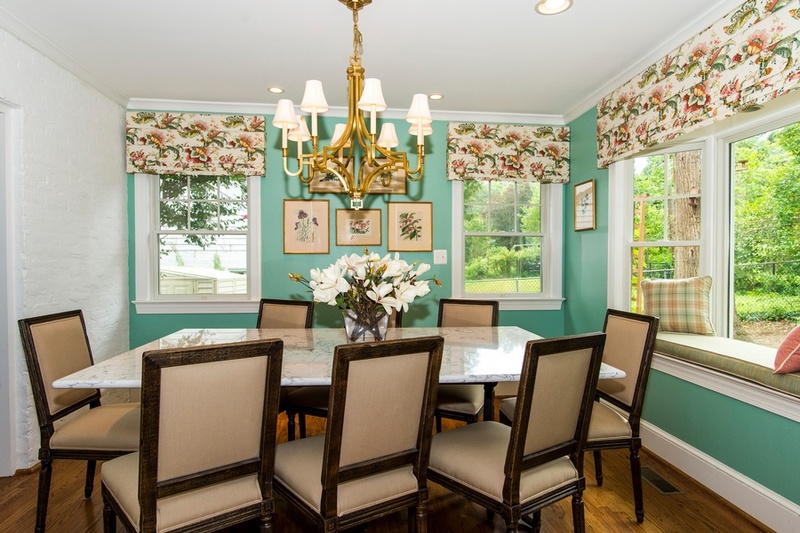 Call us to discuss your ideas and together we can create a space you will love.